It’s not a play you see very often. When it happens twice in a day, then, it certainly garners a bit more attention. That is, if a star player didn’t get hurt on the first instance, and the second instance doesn’t occur in a West Coast game that is of little interest to the non-diehard observer. Yesterday we saw two players tag up and try to score on pop-ups to infielders. Josh Hamilton infamously gave it a go in an afternoon game, while Corey Patterson made his attempt many hours later out in Seattle. Both failed. Still, the process is the thing to consider. Did Hamilton or Patterson make the right call in dashing for home? Sometimes you have to take advantage of the other team’s mental lapses. Hamilton tripled home a run in the bottom of the first, and was raring to score a run of his own. Adrian Beltre, unfortunately, popped one into foul territory on the left side. As is standard, both the third baseman, Brandon Inge, and the catcher, Victor Martinez, went out to chase it. Brad Penny made the mistake here by loafing on the mound and not covering home. Third base coach Dave Anderson noticed it, and made sure Hamilton was aware. Since it’s easier to catch a pop up when you’re facing home instead of facing the outfield, Inge made the catch. It took a second for Martinez to notice Hamilton dashing for the plate, so he took off, too. 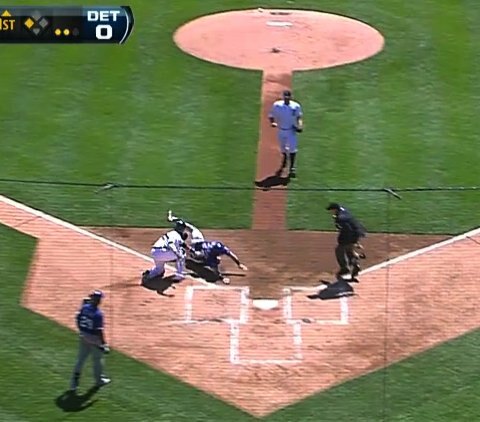 Inge tossed to Martinez, who reached out and tagged Hamilton just before he slid into the plate. And there was Penny, as you can see in the image, barely halfway to the plate. It was a lucky break for the Tigers, though not so lucky for Hamilton. After the game, Hamilton tried to rationalize the situation by saying he predicted the injury. “I was like, ‘Dude, I don’t want to do this. Something’s going to happen. '” Excuse me for a moment if I don’t believe that this is what he said to Anderson. I’m having a hard time finding any fault with Anderson, really. He had Hamilton, a fairly speedy runner, at third. He had Penny, who I imagine doesn’t win races, loafing on the mound, and he had the catcher with his back turned to the play. It was a footrace at that point, and if they replayed that 100 times I bet Hamilton would be safe far more often than not. Anderson made the right call. The Tigers were not in a position to make the play. But, because someone got hurt, the focus is taken off the process and placed on the result. That’s nice for a quick media reaction, but it doesn’t tell us anything about the merits of the play itself. This one was a winner. It’s a shame that Anderson’s reward is petulance from Hamilton. Down 3-0 for most of the game, the Blue Jays mounted a comeback in the eighth. Patterson singled home two runs, putting himself on first with one out. Then he stole second, advancing to third when the throw went into center field. So there the Jays were, runner on third with one out, and Jose Bautista’s prodigious power at the plate. It was easy to envision a sac fly to tie the game. Apparently, Patterson envisioned it too vividly. Bautista fouled off a pitch well into foul territory behind first base, and Justin Smoak had enough room to haul it in. That’s when Patterson broke for home. Smoak anticipated it, or was alerted by his fielders. His throw brought Miguel Olivo to the first-base side of home, but he had plenty of time to get in front of Patterson and tag him out. 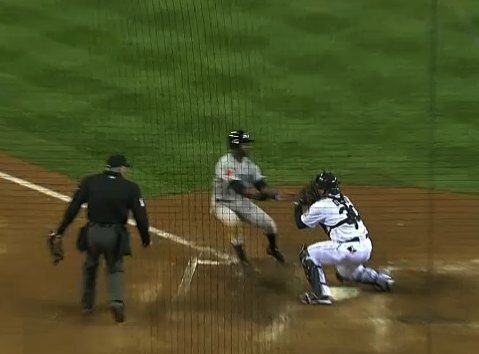 As the image above shows, Patterson was out by such a stretch that he didn’t even bother to slide . Juxtaposing these two plays makes me believe even more firmly that Anderson was right to send Hamilton. The Tigers were caught off-guard. That’s the perfect time for an aggressive move to steal a run. With Patterson, I’m not sure what the hell he was thinking. Maybe he thought Smoak wouldn’t realize the play fast enough. Maybe he thought that the suddenness of it would force him to make a bad throw. Or maybe he just overestimated his own speed. Whatever the case, it was an ill-advised tag-up that ended a potential game-tying rally. It was, without a doubt, a bad decision. Both plays ended in outs, but only one involved a commendable process. Ironically, it was the one that ended up sidelining the perpetrator for six to eight weeks. Regardless of the result, though, it was the right call. Patterson’s, on the other hand, was the wrong one. He cost his team a chance to tie the game in the eighth. Instead they went into the ninth down a run, which is where they finished. Most unfortunately, the play involving the right call has undergone the most scrutiny. I’m just glad the Rangers’ staff and front office have Anderson’s back. I hope he makes the same call again given the opportunity. We hoped you liked reading Tagging Up on a Foul Pop Out: Good Decisions? by Joe Pawlikowski! I’m not so sure. Nelson Cruz was about to come to the plate. Why take the bat out of the hands of one of your best hitters? Not a good play, IMO. And definitely not a good play by Hamilton to throw blame at the third base coach. There were two outs. To oversimply a bit, the only way Cruz was getting Hamilton home was via a base hit. Even a very good hitter is only going to succeed about 30% of the time. If you think Hamilton’s chance of scoring a run there was > 30%, it’s entirely defensible and even smart. i’m not trying to be overly negative, but what would make anyone think they have a >30% chance of scoring when the guy holding the ball is half as far from home plate as he is? there’s a reason the popout to 3b isn’t a rbi in the majors, and hamilton should have known that. he’d have had a better chance trying to steal home on the next pitch.